On July 4th, in Brussels, will take place a meeting with polyhedric Francesco Guccini. After retiring from the scenes as a musician in May 2013, he decided that although he still have lots to recounts, that’s the reason why he will keep meeting the fans in debats, encounters and projections of documentary about his incredible career. 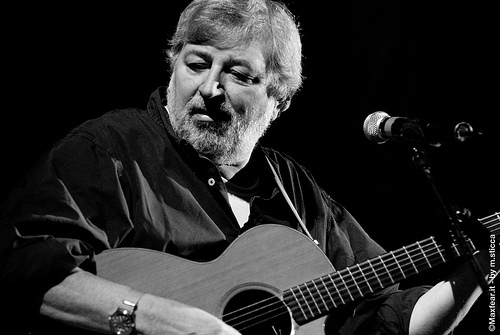 Guccini is an italian singer-songwriter, one of the most important of all times. During the five decades of his music career he has recorded 16 studio albums and collections, and 6 live albums. He is also a writer, having published autobiographic and noir novels, and a comics artist. Guccini also worked as actor, soundtrack composer, lexicographer and dialectologist. He’s considered an icon, his lyrics have been praised for their poetic, literary and politic value and have been used in schools as an example of modern poetry. In his career as a writer, Guccini published several novels and essays, experimenting with different genres. His first novel, Cròniche Epafàniche, was published in 1989. In October 2012 Francesco recorded in the midst of Tuscan-Emilian Apennines, his latest album, “L’ultima Thule”. The recording of this album was for him a return to the mythical place of his childhood, a return to roots and memories. A musical and human experience that grew in that place, day after day, gaving birth to the eight songs on the album. Directors Francesco Conversano and Nene Grignaffini filmed the whole experience, cutting and editing hours of pellicle to turn it into a documentary. And that’s what this encounter is about, hear his endless stories, see his life in studio through a behind-the-scenes privileged perspective, talk with him in an intimist athmosphere.